Provide a type of litter that your cat loves, preferably unscented. There are many litter choices, but most cats prefer clumping clay litter. To figure out your cat’s litter preference, offer different options in various litter boxes and retain the one that gets used the most. Scoop at least once a day — twice is better. Cats don’t appreciate dirty toilets. At least once a month (or weekly if it’s not a clumping-type litter), dump all the litter and wash the entire box with soap and water. Even if you have just one cat, you will need two boxes. Ideally, there should be one more box per household than the number of cats. It may be best to skip a litter box liner, as some cats don’t like the feel of the plastic and sharp cat claws can puncture the liner. Also, liners have a tendency to hinder box scooping with clumping litters. While some cats prefer covered litter boxes, most do not. Location matters. For example, litter boxes up or down a set of stairs might be a problem for older cats. Litter boxes near a loud appliance might be scary. Ideally, litter boxes should offer cats a view of what’s going on as they do their business, yet still provide some seclusion. Litter boxes should not be placed where children play, as there can be too much commotion for some cats. And when possible, keeping dogs away from the box is a good idea. Supersize the boxes. Big and overweight cats just don’t have enough elbow room in many of today’s boxes. Try a plastic storage container instead (the kind used to store sweaters under the bed). 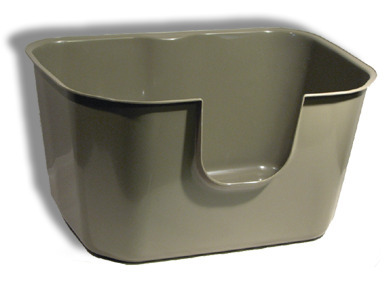 If the cat is standing in the box but the urine ends up outside, try a plastic storage box with high sides. Just remember to cut out an opening (that isn’t sharp) so the cat can easily get in and out. Anxiety can play a role in cats missing the box. More than anything else, cats dislike change. The death of a pet, the addition of a new pet, or the owners going away on vacation can prompt a cat to miss the box. Give the offender a chance to blow off that stress by offering more interactive play and providing environmental enrichment. Another cause for anxiety may be the relationships in multi-pet homes. Cats can be surprisingly subtle about their disagreements. You may not see any overt catfights, but one cat may still be subtly preventing another from using the box in peace.